CROSBY, Texas–Two workers were transported by helicopter to Memorial Hermann Hospital Friday morning Dec. 24, 2010 after an explosion at a plant. The incident happened around 6 a.m. at the KMCO plant at 16500 block of Ramsey Road. Crosby Volunteer Fire Department officials said the explosion happened in Reactor 1 where the two men were working. Of the two injured men, one is in critical condition and the other is stable. HAZMAT crews responded to the scene to check air quality, and Harris County deputies had to close nearby roads. The rest of the employees at the plant were not evacuated. The plant specializes in making brake fluid and anti-freeze. HARRIS COUNTY The U. S. Attorney for Houston, Jose Angel Moreno, on Tuesday unsealed a federal grand jury indictment against County Commissioner for Pct. 4 Jerry Eversole and another, businessman Michael Surface. Eversole and Surface appeared in federal court on Tuesday, bound in handcuffs and shackles, a pitiful site for a powerful office holder such as Eversole. Both defendants pleaded not guilty, and were released after posting $100,000 bond each. Eversole is charged in the detailed indictment, with receiving such things as vacations, clothing, antique firearms, and financial support for his home mortgage from Surface, and in return voting to award Surface and several of his companies with lucrative county contracts. He also appointed Surface to the Sports Authority Board, and even conspired to retire in favor of Surface assuming his commissioners seat, according to the indictment. Eversoles attorney, Rusty Hardin, stated that the two men have been friends for over 25 years, and the dealings were personal and not related to county business or favors. Eversoles trial is set for February 22 before Judge David Hittner. The government is asking for restitution of all monies, and punishment that could be as much as 20 years in jail. MONT BELVIEUThe City of Mont Belvieu will celebrate the grand opening of its new 70-acre park and sports complex with a New Years Eve Bash. The event will kick-off at the park on Eagle Drive at 5 p.m. with a ribbon cutting and opening ceremonies. From 6 to 10 p.m. there will be rides for the kids and food. Hot dogs, chips and drinks will be sold for $1. BBQ sandwiches, chips and drinks will be sold for $1.50. Vendors will be on hand to sell kettlecorn, funnelcakes and lemonade. Volunteer groups will serve hot chocolate, coffee and cider. Three county bands will provide the entertainment in the parks amphitheater. Leading off at 6 p.m. will be local artist Jimmy D. Smith. At 8 p.m. Django Walker, son of Texas music legend jerry Jeff Walker will take the stage. The new park has been four years in design and construction and features, nine lighted ballfields, three multi-purpose fields, seven playgrounds, two group pavilions, a splashpad, skatepark, amphitheater and large amenity pond. Everyone is reminded to bring your lawn chairs to enjoy the bands in the amphitheater. Also, alcohol is prohibited in the park and coolers are prohibited for this event. HIGHLANDSEfforts to contain hazardous materials leaking into the San Jacinto River from waste pits could start in as soon as Jan. 5, says the Environmental Protection Agency. Valmichael Leos, a project manager with the EPA Region 6 office said International Paper and McGinnes Industrial Maintenance Corporation, (the PRP or Primary Responsible Parties) have begun the site management work, which includes clearing away brush, installing a decontaminate line and setting up a trailer to serve as an on-site office adjacent to the waste pits. Construction of the actual containment berm is scheduled to begin Jan. 5. Status reports are available online at www.epaosc.org/SanJacWPremoval. The berm, Leos said, would be a barrier designed to temporarily contain the contaminants until a permanent solution can be found. The EPA was successful in getting a barrier comprised of clean fill (earthen material, sand, rock and gravel) that can withstand a 100-year flood event. Leos said that their primary goal is to stabilize the source and keep it from going into the river. He added that he suspected the PRPs reluctance has to do with the expense of the project. He estimated the cost for the containment the EPA is asking for would be in the $7 million-range. A cost the PRP would have to pay from their own pockets. LIBERTY COUNTYDry weather conditions, and the threat of wildfires had prompted Liberty County to order an outdoor burn ban. The order does not prohibit outdoor activities 1)related to public health and safety that are authorized by the Texas Natural Resources Commission for: (a)Firefighter training; (b)Public utility, natural gas pipeline, or mining operations; or (c).Planting and harvesting of agriculture crops; or 2) burns that are conducted by a prescribed burn manager. Violation of the burn ban Order is a Class C misdemeanor, punishable by a fine not to exceed $500. On Dec. 14, commissioners added a ban on aerial fireworks. 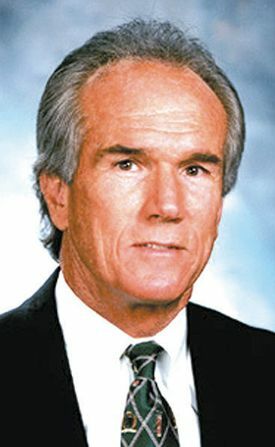 The fireworks included in the ban skyrockets with sticks and missiles with fins said County Judge Phil Fitzgerald. The ban is schedule to be in effect for 90 days from the order date, unless cancelled by commissioners court. EAST HARRIS COUNTYHow efficient are school districts like Crosby, Goose Creek and Huffman spending their funds? A new state report might just answer that question. The State Comptroller of Public Accounts has produced the first ever efficiency study of how effectively the states school districts utilize their monies. The Financial Allocation Study for Texas (FAST) was created to examine how school districts and campuses spend their money  and how this spending translates into student achievement. Each district and campus is assigned a FAST rating of one to five stars, indicating its success in combining cost-effective spending with the achievement of measurable student academic progress. Five stars reflect the strongest relative progress combined with the lowest relative spending. Districts earning the most stars are the ones with low or very low spending. This would indicate that the districts are able to achieve academic success while keeping costs in-check. Districts with high spending generally scored poorly on the FAST rating. The report also shows that Crosby ISD is in the 35 percentile for combined math and reading progress. The district is the 50 percentile for combined math and reading progress. Huffman ISD services 3,044 students. They earned three stars as well. While they had a very low adjusted spending of 5,924 per pupil, their combined math and reading progress in the 14 percentile. Academic Progress, Cost-Adjusted Spending and Spending Index measures are three-year averages through 2008-2009. All other academic data, including accountability ratings, are from 2008-09. Through the State Comptrollers office, school districts can access advice on improving their ranking by studying financial allocation smart practice tips shared by school districts across Texas on a range of topics including instruction and staffing, financial management and technology solutions, purchasing and student services and facilities. CROSBYA report issued by the Texas Comptrollers Office shows positive growth for the local economy. One of the factors used to determine fiscal health and the future financial health of a community is sales tax collection. A comparison of November 2010 state sales tax collection to November 2009 collection shows Crosby far exceeding the state average of an 8.7% increase. The Harris County Emergency Services District #5 (the EMS) has a 1% sales tax. Their November collection was $1,26,598.09. This is a 40.04% percent increase over November 2009, when revenue collected was $90,396.87. Year to date tax sales tax collection for the ESD has been $1,515,801.81, up 17.32% from 2009 figures. The Harris County Emergency Services District 80 (fire department) also has a 1% sales tax. They had a similar November to ESD 5. This year, their collection for the month was $131,857.04, up 43.69 % over 2009s $91.767.16. Year to state revenue is up 13.82%from $1,301,679/14 in 2009 to $1,481,701/17 this year. In Highlands, the ESD #14 (fire and EMS) had a November collection of $46,432.82. On April 1, 2010 a 2% sales tax went into effect for the district. Since that time, they have collected $335,589.98. The Comptroller will send cities, counties, special purpose districts and transit systems $435.8 million in December sales tax allocations, up 4.5 percent compared to last December. The final sales tax allocation of 2010 brings local sales tax revenue for the year to $5.6 billion, a fraction of a percent less than in 2009. November state sales tax collections and December sales tax allocations to local governments represent sales that occurred in October. The next local sales tax allocation will be made on Jan. 14. MONT BELVIEUKnives, bone saws and electric meat tenderizers may not be the typical items found in a classroom, but for students in Barbers Hill FFAs Meat Processing class they are the tools of the trade. Mary Wilson, FFA instructor, said the school began the program seven years ago because she saw a way to prepare students for jobs after graduation. There is a huge industry out there for meat processing, especially on the college level, she said. Wilson said that once a student completes the class they would have the skills to work in any butcher shop or grocers meat market. Not only will this give them job skills, but also it can lead to a career she added. Wilson noted that one former student who went through the program later attended Texas A&M university, where she earned a degree in Meat Science. That former student is now in charge of making all meat purchases for Houston Independent School District. Starting next semester, students enrolled in the class will earn dual credits through Central Texas College. Barbers Hill is nearly unique in offering the class. Wilson said that there are only five such programs offered in Texas. The meat processing class is offered in two parts. The first part is an introductory class, where students learn sanitation, industry standards, health department regulations and safety. They then go onto the actual processing, where they have classes in animal anatomy and the standard cuts of meat. Student Heather Caudle said she is taking the class to learn the skills and giver herself job options. Since Barbers Hill does not have a kill floor meat arrives in boxes, as it typical in butcher shops. The meat that comes in is the ones usually found on meat counters such as brisket, poultry, pork and lamb. Students also learn to make boudain as well as smoked sausage. The fall, however, means deer. Area residents can bring in deer and have the students process it for a fee of $125, quite a bit less than professional butchers. Wilson said that in the past couple of weeks 17 deer have been brought in for processing. HIGHLANDS The program is called Christmas cards for our Troops. Its mission: to put smiles on the faces of as many of our U.S. troops from Texas as possible. And no school in the 2nd U.S. Congressional District accomplished that mission better than Goose Creek CISDs Highlands Elementary School. 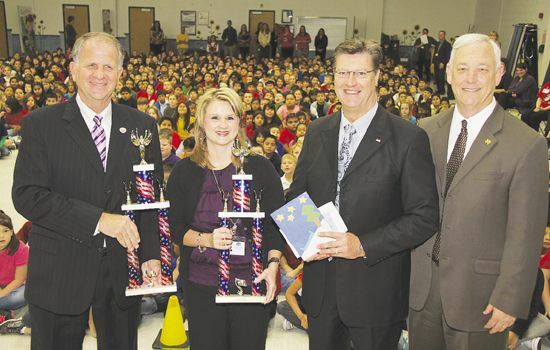 On Nov. 29, Congressman Ted Poe presented the student body and faculty of Highlands Elementary School with two trophies  one for 2009, the other for 2010  for the most Christmas cards and for the Most Creative Cards for our troops. Poe singled out three Highlands Elementary School teachers behind the schools Christmas card drive: music teacher Donna Johnson, art teacher Sandra Marquez, and computer literacy teacher DAnn Gonzalez. Each hand-decorated Christmas cards included a note from the teacher, and a CD of Christmas music sung by Highlands Elementary students. For the past four years, Congressman Poe has been collecting Christmas cards to distribute to U.S. servicemen and women who are serving our country in Iraq and Afghanistan. 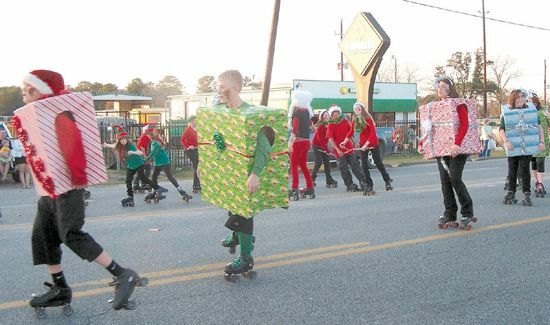 Poe said no school district in his district sends more Christmas cards than Goose Creek CISD. This school district has been very, very energetic in producing these Christmas cards, Poe said. Poe said he got more than 10,000 cards from Goose Creek CISD. They really appreciate the support, he said. Principal Ruth Perrin told the students and staff, I am so proud of you, holding both trophies high. 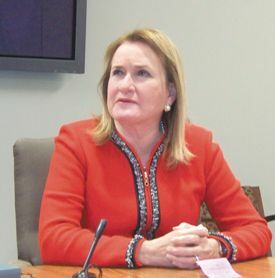 Precinct 2 Commissioner Sylvia Garcia held an informal meeting with local media last week, to give her an opportunity to thank the community for the opportunity to serve, and to reflect on her 8 years in office, with work done and also some projects not finished. After a surprising defeat by newcomer Jack Morman in last Novembers election, some of the questions she fielded were about her campaign and the results of the vote. She attributed her defeat to three factors: straight ticket voting due to the unpopularity of the current administration, her association with Obama on some issues, and her Hispanic family name at a time when immigration is an unpopular issue. Although Precinct 2 is an Hispanic district by population, its voter roles are only about 25% Hispanic, suggesting she did not get enough of that support. In fact she lost by 2,310 votes out of about 130,000 that were cast. She discussed the accomplishments of her two terms in office, such as the Port Authority, NASA, establishment of the Independence Parkway and the Stars project, new county parks, a master plan for the future of Precinct 2, work with the Economic Alliance and local industry, establishment of a Precinct wide bus transit system, work with seniors, youth, veterans and the hungry in Precinct2gether, establishment of a LifeFlight heliport in Baytown, survival and rebuilding after Hurricanes Ike and Katrina, and improvement in the environment, in the rivers and in the air quality. She said she was glad to continue the work of her predecessor, Commissioner Jim Fonteno, who established many of the community centers and parks to serve the communities. Garcia said she did not have any immediate job plans, and would be happy to relax with her family. Although single, with eight brothers and sisters she said that family has always been important to her. She is also concerned about her Precinct 2 staff, and whether they will remain or move on to other jobs. Precinct 2 has over 500 employees, and a budget that was as high as $65 million dollars. She was also busy packing for her departure, and archiving some of the material she has accumulated in eight years. When asked about any ambitions for office, she said she did not know if she would run for commissioner again. It depends upon what happens, and I will look at all decisions. Garcia did not indicate any interest in state or national office, directing most of her comments to Harris County. However, she is president of the National Association of Latino Elected and Appointed Officials (NALEO) and has gained national attention. She also expects to stay involved in some of the projects she started, such as the STARS or Independence Parkway project. She is on the board of the Economic Alliance, which has spearheaded this project. As for the future of the county and the precinct, she thinks the new commissioner, Jack Morman, will face a challenging set of problems in the current economy, since the budget must be cut by a sizable amount. Other problems he will face include Mobility, including rail, Metro, and the port; and air quality versus the needs of the petrochemical industries. Morman has issued a memo to Pct. 2 staff, indicating he does not plan on any significant changes at this time. Garcia expects the east side of Harris County to continue to grow, with the Port Authority and the chemical complexes as major factors to spur this growth. She cautioned that the county must think regionally, not locally, to solve their problems properly.